In Prince Tudor (1999), his second verse drama, Nicholas Hagger tells the story of a Prince’s heroic attempts to preserve the culture and identity of his disintegrating kingdom from the intrigues of globalists. Written in the dramatic tradition of Sophocles, Shakespeare and the Elizabethans, Prince Tudor is a tragedy bristling with topical references that reveals the nightmare behind the national dream. Prince Tudor is a modern-day Hamlet, skilfully crafted to “catch the conscience” of the nation. There are also two new verse dramas, both of which develop and elaborate themes taken up in the previous two plays. Nicholas Hagger’s previous verse drama, The Warlords, explored the role of an embryonic world government in shaping the outcome of World War II and, in particular, its influence in cutting Britain down to size. In Prince Tudor, his latest work for the theatre and another important contribution to the revival of verse drama, Hagger applies the theme to contemporary Britain and so dramatizes what is set to become a burning issue of the new century – Britain’s fight to preserve its sovereignty. Who is trying to destroy the monarchy and why? Will the country sell its soul to the world government or follow the guidance of the heir to the throne, Prince Tudor, and so find its true path? 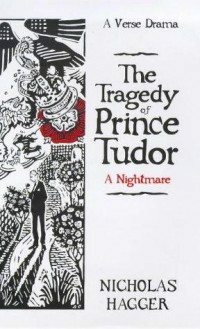 Written in the dramatic tradition of Sophocles, Shakespeare and the Elizabethans, Prince Tudor is a metaphysical tragedy with many topical references that reveal the nightmare behind the modern materialist dream. It is the story of one man’s heroic struggle to hold together his disintegrating kingdom and save a nation hijacked by self-appointed agents of world imperialism. As such, Prince Tudor is a modern-day Hamlet, skilfully crafted to ‘catch the conscience’ of the nation and restore its shattered unity. You say you have distaste for our England. You’re of the past – deluded, out of date. Has no place for royals in new England. We are against history as that is past. We are for the future and the people. What you call conspiracy’s our future. The present is what has flowed from the past. The future’s what will flow from the present. Against the current. You will be submerged. You cannot dam the current of history.